ASK TEMI LIVE! | Listen Free on Castbox. Welcome to Ask Temi Live! where we discuss the best ways to establish your business, protect your name, and keep your profits. 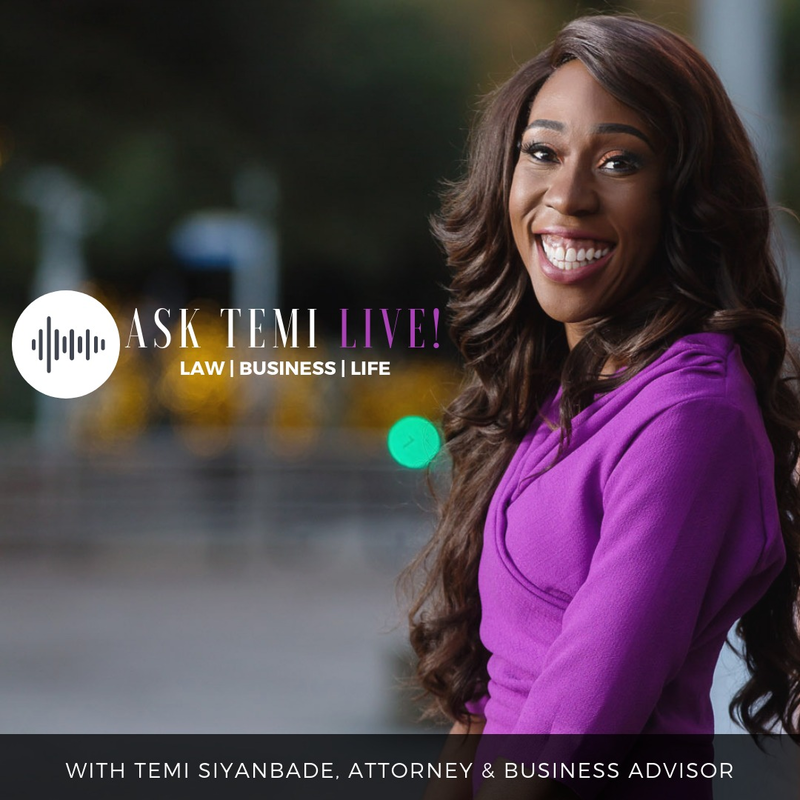 Each week Temi Siyanbade, Houston based attorney, explores the mistakes and successes of real life businesses from a legal and business perspective. The decisions we make each day have the potential to make or break our businesses and our lives. Your invited to build your business the right way from the beginning. Connect with Temi on Instagram and Facebook @toslegal. Find additional resources by visiting www.toslegal.com. Music: Social Kapital by Glad Rags. How close is too close when it comes to naming your business? How important is it to have a business name that is distinct from other businesses? What are the factors that you need to consider when your trying to make a decision about your business name?Today, let's tackle these questions so that you don't make some of the fatal naming mistakes that could shut your business down.Copyright © 2018 Temi Siyanbade. All rights reserved.Music: Social Kapital by Glad Rags. QOTD: Can you use trademarked names in different industries?You've discovered the perfect name for your new business, but there's one hiccup. Another business across the country has the same name--in a different industry. What are your options?Find out as Temi Siyanbade, Houston based trademark attorney tackles this question while sharing the story of Lush Cosmetics and Bath Works vs. Lush Fashion.Copyright © 2018 Temi Siyanbade. All rights reserved.Music: Social Kapital by Glad Rags. Entrepreneurs are constantly trying to decide whether they should name their businesses after themselves, but I great question to ask is, "what does the law require? "SERIES: Luxury brands like Louis Vuitton and Hermes understand that brand name and value are worth more than a businesses tangible assets. One proverb puts it this way, " A good name is more desirable than great riches; to be esteemed is better than silver or gold." (Proverb of King Solomon).So it begs the question, how do we choose, develop, and protect the names of the businesses we start?That's what we'll be exploring over the next few weeks on Ask Temi Live!Today's video addresses one of the factors when deciding whether to use your personal name for your business brand.Copyright © 2018 Temi Siyanbade. All rights reserved.Music: Social Kapital by Glad Rags.